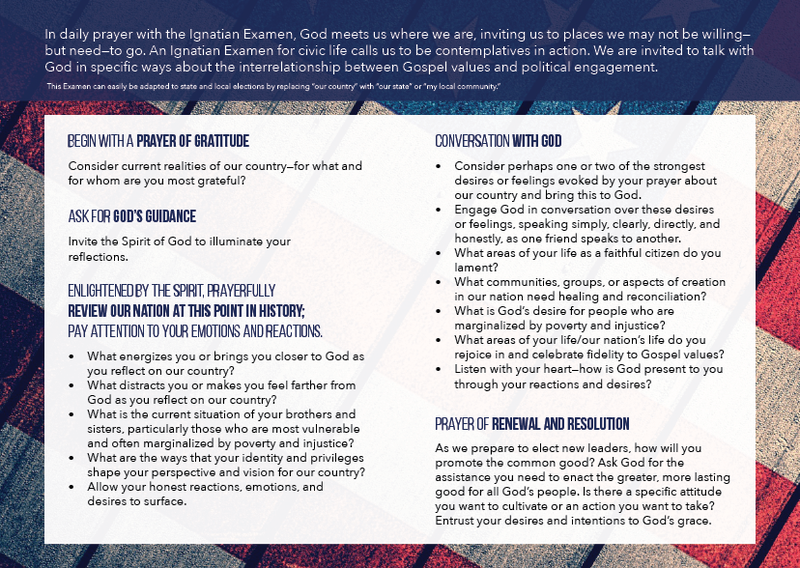 Ignatian Examen: Invite your community to pray, reflect, and discern the interrelationship between Gospel values and political engagement. The Daily Examen, an ancient practice in the Catholic faith tradition, is a technique of prayerful reflection on the events of the day in order to detect God’s presence and discern a direction forward. In his Spiritual Exercises, St. Ignatius of Loyola described the Examen as a gift that came directly from God, and that God wanted it to be shared as widely as possible. One of the few rules of prayer that St. Ignatius made for the Jesuit order was the requirement that Jesuits practice the Examen twice daily—at noon and at the end of the day. It’s a habit that Jesuits, lay collaborators, and many other Christians, practice to this day. In daily prayer with the Ignatian Examen, God meets us where we are, inviting us to places we may not be willing—but need—to go. The Ignatian Examen for Civic Life calls us to be contemplatives in action. We are invited to talk with God in specific ways about the interrelationship between Gospel values and political engagement. Click the image to view the sample pamphlet. The actual size of the pamphlet is 5×7 in folded.